This unique, sunny hotel is situated just 150 m from Levante beach. In the surroundings, guests can find a wide variety of restaur.. This attractive beach hotel is situated in the vibrant tourist hub of Benidorm. The hotel is located just a few metres from the li..
Hotel Mar Blau is an establishment that has 2 stars and is located in the province of Alicante, more specifically in the town of B.. The family-friendly hotel Poseidon Playa is ideally situated, only 60 m away from the sandy Poniente Beach in the popular holiday ..
Modern hotel located at the entrance to the city of Alcalá de Henares. Hotel Ibis Alcalá La Garena is a functional hotel perfect for business and leisure stays, because it is very close to the industrial estates of Corredor de Henares as well as the A2 motorway and main means of transport that will take you to the city centre. The hotel has 92 bright soundproofed rooms, fully equipped and with WIFI internet access. Notice children under 12 years are free if sharing bed with parents. This beautiful hotel is located in Benidorm's tourist centre, only 2 km from the town centre, which is filled with boutiques, cafés, bars, restaurants and nightclubs. There are public transportation links in front of the hotel and there is an excellent golf course just 12 km away. 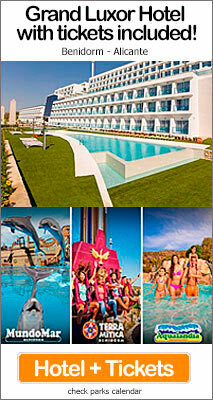 This hotel is ideal for a fun-filled, family holiday under the warm Mediterranean sun. However, hen and stag parties are not allowed at the hotel. Situated in Benidorm, just a few minutes from the resort centre, with bars, restaurants, shops and nightlife.